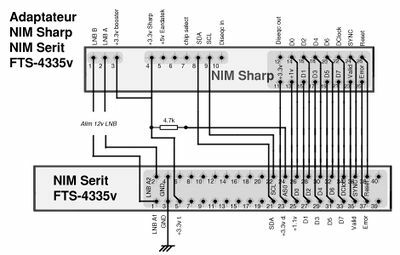 As of February 2017 the Sharp and Samsung NIMs are no longer available and the MiniTiouner project will use a NIM (or tuner) from Serit which covers from 143.75MHz right through to 2450 MHz without the need for any upconverters. The first prototype was shown at CAT16 by Jean-Pierre F6DZP - you can watch a video of his presentation on the BATC Youtube channel. Why should I buy a Serit tuner? 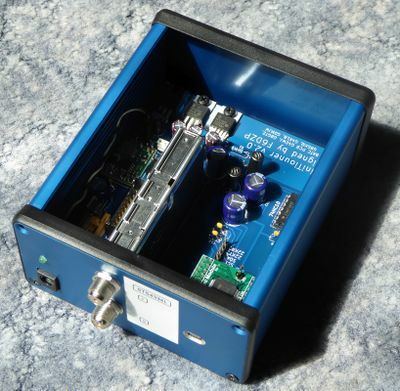 You should buy one if you already have MiniTiouner hardware and you want to be able to receive 146 MHz and 70cms without building an upconverter. You should buy one if you already have MiniTiouner hardware and want to experiment with the higher DVB-S2 modes such as 32APSK which the Sharp NIM cannot demodulate. You should buy one if you have not yet built a MiniTiouner receiver as the previous Sharp tuner is no longer available. If none of the above apply, you don't need one! 1 2 versions of the Serit NIM! 2 versions of the Serit NIM! Just to confuse the issue there are now 2 versions of the Serit NIM! 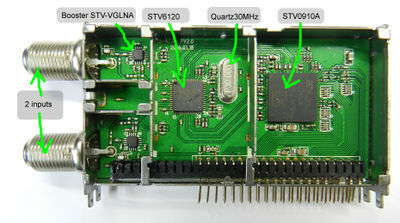 Both types work with the new Version 2 MiniTiouner PCB and adapter card for the Version 1 PCB. The only difference between the FTS-4335V, which was sold in the BATC shop before before April 2017, and the FTS-4334L sold after May 2017 is the addition of an internal amplifier or booster stage before the demodulator chip. The pinout of both tuners is the same and they are interchangeable in the MiniTiouner PCB. The units can be identified by the model number, which is printed on the opposite end of the unit to the F type connectors. To overcome the lack of the booster, an additional satellite line amp can be used in front of the tuner. The FTS-4334L unit has a built in booster and will not require an external line amplifier. 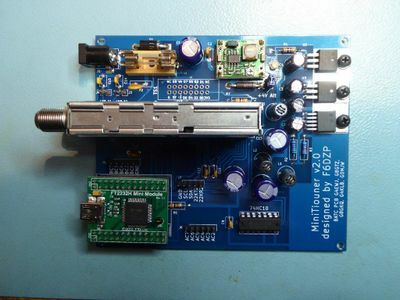 The Serit tuner has a different pin out to the original Sharp unit and as of April 2017 a version 2 main PCB has been designed to directly take the Serit tuner - see this page for details -any new constructors should use this version 2 new board. Note the A input is the upper connector (furthest from the PCB). The B input is the lower one, closest to the PCB. 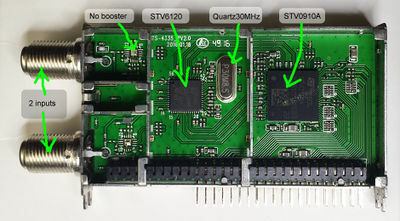 The Serit tuner has a different pin out to the original Sharp unit and Brian G4EWJ has designed a PCB to enable it to be plugged in to the original Version 1 MiniTiouner PCB. You only require the adaptor PCB if you are upgrading a MiniTiouner version 1 hardware to use the Serit tuner. To use either Serit NIM with the MiniTiouner, you will need to run Ver 0.6d or later versions of the excellent MiniTioune software. This is available for download from the Viva DATV forum here and will work with Sharp, Eardatek or Serit NIMs. You need to register on the Viva DATV forum before being able to download. MiniTiouner version 6 or later also allows you to select which of the two antenna sockets is used on the Serit NIM, allowing one of two antennas / converters to be connected. The wide band coverage makes building a receiver for 146 or 437 much easier, although you will need a pre-amp followed by lots of filtering for each band, just like the Sharp did. This page was last modified on 1 October 2017, at 18:58.